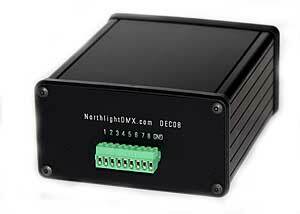 Northlight Systems DMX512 decoder, 0-10 VDC output. Northlight's decoders will receive DMX512 digital protocol for Stage lighting products and converts it into 8 or 24 analog voltages. No complicated setup, basically the board is plug and play. 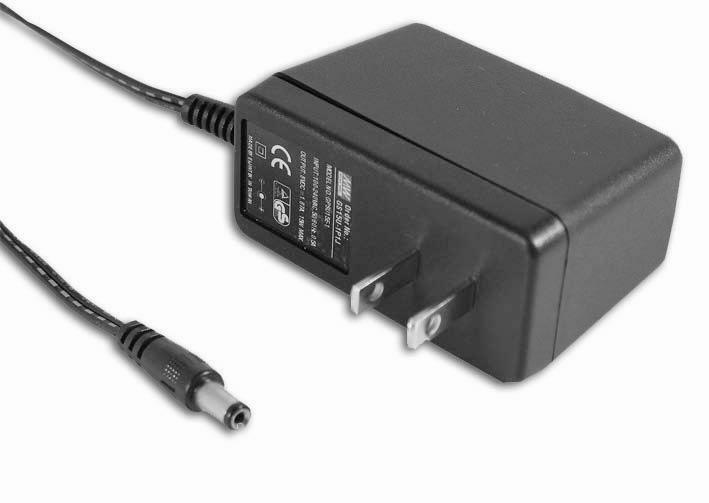 Easy to use screw terminals, just supply a transformer or. 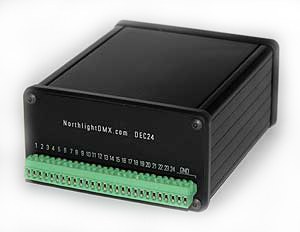 The Northlight Systems DMX decoder board is capable of receiving DMX512 signals. Output voltage 0-12 VDC or 0-15 VDC on request, no additional cost. Will source or sink 0-10VDC. Great for LED or Fluorescent fixtures that require current sink control. 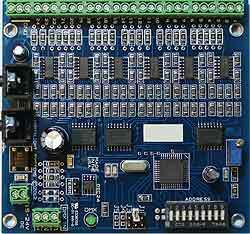 All channels output range is jumper selectable, 0-5 or 0-10VDC. Address selection has 3 switch options described below. Jumper selectable on board Terminator. 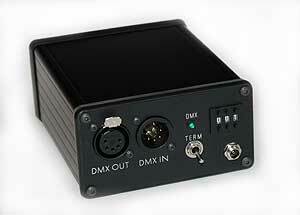 Low power, advanced features, DMX receiver chip, represents 1/4 unit load to DMX system. There are 4 options shown below. The address is entered in standard binary code, starting with 0. NEW - Includes alminum monting plate. Includes LED,switch and connecting lead. The Push button BCD switch is a snap fit in flat panels up to .060" thick. The Address is entered direct starting with 1. Decodes a block of 8 channels, starting at the selected address. 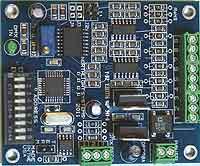 0-10 VDC or 0-5VDC output. Download the manual for the 8 channel decoder in PDF format. $110.00 - DEC08MP - Mini DIP sw., panel mount with LED's. $130.00 - DEC08P - Push button switch with LED. This is not a kit. Fully assembled, plug and play. Compact size 2.25"H X 4"W X 5" L.
Includes UL listed, slimline switching wall mount power supply, universal AC 100-240 volts. Uses quality Neutrik 5 pin XLR connectors for DMXin and DMX out. Terminator switch on front panel. Screw terminals on output side. Ships complete, just like in the picture. Decodes a block of 24 channels, starting at the selected address. Download the manual for the 24 channel decoder in PDF format. We combine shipping. PayPal has changed the way it calculates shipping and may over charge. If you over pay for shipping we will refund the difference from actual cost. Other payment options include Company check, Electronic funds transfer, Western Union. Email for more information.